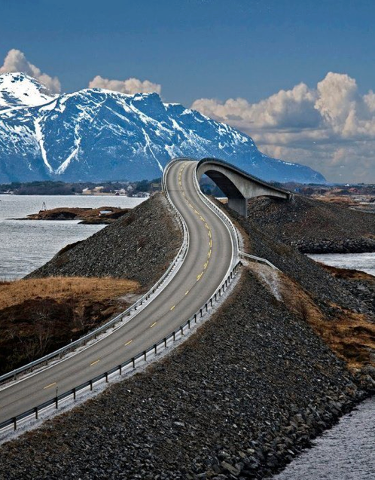 The Atlantic Ocean Road or the Atlantic Road is a 8.3-kilometer (5.2 mi) long section of County Road 64 which runs through an archipelago in Eide and Averøy in Møre og Romsdal, Norway. The fixed link passes by Hustadvika, an unsheltered part of the Norwegian Sea, connecting the island of Averøy with the mainland and Romsdalshalvøya peninsula. The road runs between the villages of Kårvåg on Averøy and Vevang in Eida. The road is built on several small islands and skerries, which are connected by several causeways, viaducts and eight bridges—the most prominent being Storseisundet Bridge. The route was originally proposed as a railway line in the early 20th century, but this was ultimately abandoned. Serious planning of the road started in the 1970s, and construction started on 1 August 1983. During construction, the area was hit by twelve hurricanes. The road was opened on 7 July 1989, having cost 122 million Norwegian krone (NOK), of which 25 percent was financed with tolls and the rest from public grants. Collection of tolls was scheduled to run for 15 years, but by June 1999 the road was paid off and the toll removed. The road is preserved as a cultural heritage site and is classified as a National Tourist Route. It is a popular site to film automotive commercials, has been declared the world's best road trip, and been awarded the title as "Norwegian Construction of the Century". In 2009, the Atlantic Ocean Tunnel opened from Averøy to Kristiansund; combined, they have become a second fixed link between Kristiansund and Molde.